Abstract - Designing routing metrics has a significant impact on performance in wireless mesh networks (WMNs). During the implementation of routing protocols, routing metrics are assigned to different paths and the calculation of the best paths is a function for predicting the best routing path. This paper proposes an enhancement to the Multi-Hop Effective Bandwidth (MHEB) routing metric commonly used in WMNs. The proposed routing metric, called improved Multi-Hop Effective Bandwidth (iMHEB), considers the wireless link asymmetry to improve the MHEB routing metric. The proposed routing metric is implemented into the reactive routing protocol Ad-hoc On Demand Distance Vector (AODV) and it achieves efficient link quality and interference awareness. An OPNET based simulation results show that the iMHEB routing metric has greater throughput compared to MHEB and the Weighted Cumulative Expected Transmission Time (WCETT) routing metrics. Abstract - Missing value imputation methods are widely used in solving missing value problems during statistical analysis. For classification tasks, these imputation methods can affect the accuracy of the Bayesian network classifiers. This paper study's the effect of missing value treatment on the prediction accuracy of four Bayesian network classifiers used to predict death in acute chronic Hepatitis patients. Missing data was imputed using nine methods which include, replacing with most common attribute, support vector machine imputation (SVMI), K-nearest neighbor (KNNI), Fuzzy K-means Clustering (FKMI), K-means Clustering Imputation (KMI),	Weighted imputation with K-Nearest Neighbor (WKNNI), regularized expectation maximization (EM), singular value decomposition (SVDI), and local least squares imputation (LLSI). The classification accuracy of the naive Bayes (NB), tree augmented naive Bayes (TAN), boosted augmented naive Bayes (BAN) and general Bayes network classifiers (GBN) were recorded. The SVMI and LLSI methods improved the classification accuracy of the classifiers. The method of ignoring missing values was better than seven of the imputation methods. Among the classifiers, the TAN achieved the best average classification accuracy of 86.3% followed by BAN with 85.1%. Abstract - In this paper, simulation and analysis the performance of existing MAC layer protocol and hybrid MAC with TDMA protocol in wireless local Area Network is presented. The demands of WLAN Devices day by day increases exponentially and it operates in the specific narrow spectrum of frequency bands and also increase communication parameters programmed and control over most modern wireless devices. In this simulation, we present a MAC protocol based on IEEE 802.11g standard in the DCF mode and DCF with TDMA mode which are useful to improve packet collision in traditional wireless networks. In this analysis, improved performance with TDMA base MAC layer is compared without TDMA. Here we used simulation through using NS-2 Simulator. Abstract - Among other sectors such as trade, financial affairs, economics, shipment, and IT appliances, Shanghai has become one of the fastest growing and largest international metropolises in the world. With its 500 thousand foreign residents, Shanghai has been ranked as the city with the highest rate of international residents in China. Unfortunately, there are no appropriate or tailor-made service packages within China's mobile telecom services allocated to foreign users of the mobile communication industry in Shanghai. The current paper aims to find out about the key factors of the mobile telecommunication industry, which are strongly correlated to customer satisfaction in China. The exploratory study is primarily based on data collected among China Mobile's foreign users in Shanghai. The sample consists of 259 foreign residents randomly selected from the population frame offered by the ones who have settled down in Shanghai. Although the findings of this study are specific to China Mobile, they can also be generalized to other companies operating in this business area in China. Suggestions are also offered for further research. Abstract - In single sensor digital color cameras at each pixel it captures only one of the three primary colors so the full color image is obtained by interpolating all other missing color samples at that pixel this process is the color demosaicking process. When we capture the images using digital cameras there is some sensor noise is introduced in image. This type of noise is introduced in all type of digital cameras that is low cost to high cost. So in reconstructing the images there are different strategies used to obtain the good quality images. Basically there are three different strategies, first strategy is demosaicking the image and after that denoise the image but in that process the artifacts occurs in initial color demosaicking method is hard to remove in subsequent denoising process. Second strategy is joint denoising demosaicking and third strategy is denoising before demosaicking so here last strategy is used. In this paper here first denoise the CFA image to remove sensor noise for that here use PCA based adaptive denoising method and after that demosaicking the image with nonlocal adaptive thresholding method. So here main advantage of this implementation is that by the use of Principal component analysis (PCA) based denoising this algorithm remove the sensor noise and by using the Nonlocal adaptive thresholding for demosaicking it reconstruct good quality images which having sharp color transition in it. Abstract - The paper presents the parallel algorithm for solving the scheduling problem. This algorithm is implemented in the distributed memory multi-computers, and with each machine using CPU - GPU shared memory architecture, so that the time to complete the work as quickly as possible. This algorithm is based on the branching algorithm approach for searching. The experimental results for the scheduling problem were calculated with large data. From that determines the threshold of input data of the problem in order to the computation time is minimum. 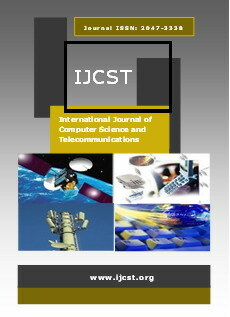 Abstract - In this paper, the performance of the classifier for classifying the Remote Sensing (RS) images is evaluated. The variety, type and extent of land cover throughout a region can be estimated through satellite remote sensing. This meets a need common to ecological applications. Land cover classification is undertaken through RS images acquired by multispectral sensors. In this study, Walsh Hadamard transform was used for feature transformation of the RS images and information gain for feature reduction. The features selected were classified using Naive Bayes, k Nearest Neighbor, J48 decision tree and Support Vector Machine (SVM). The classifiers were evaluated using a Subset of Salinas dataset consisting of corn_senseced_green_wees and Lettuce_romaine_5wk. Abstract - This paper presents a new approach using Hidden Marko Model as classifier and Singular Values Decomposition (SVD) coefficients as features for face recognition. As face is a complex multi-dimensional structure and needs good computing techniques for recognition and it is an integral part of biometrics. Features extracted from a face are processed and compared with similar faces which exist in database. The recognition of human faces is carried out by comparing characteristics of the face to those of known individuals. Here seven state Hidden Markov Model (HMM)-based face recognition system is proposed. A small number of quantized Singular Value Decomposition (SVD) coefficients as features describing blocks of face images. SVD is a method for transforming correlated variables into a set of uncorrelated ones that better expose the various relationships among the original data item. This makes the system very fast. The proposed method is compared with the existing techniques. The proposed approach has been examined on ORL database and some personal database. The results show that the proposed method is the fastest one, having good accuracy. Abstract - A good understanding of the cloud computing technology, its components and their interrelationships is crucial for decision makers who intend to adopt this novel technology. Towards the end-goal of establishing a simple cloud computing platform which satisfies some of the scientific needs of the academic and research community within the academic institutions, in this paper we propose a simple design of a cloud computing platform for a school or a University and illustrate the components of this platform and their interrelationships. This paper helps to better understanding of the technology that enables the academic community to perform research experiments on clouds in order to design more efficient portals and gateways for the clouds, and facilitate the adoption of this novel computing. Abstract - Due to the recent progress in internet technology and evolution of very high speed networks operating everywhere, protection of digital content is must. So, it has become a tough task to protect copyright of an individual's creation. The purpose of digital watermarking is to incorporate concealed information in multimedia content to ensure a security amenity or simply a labeling application. This paper then categorizes the various watermarking techniques into numerous categories dependent upon the domain in which the concealed data is inserted. We have also provided the comparative analysis of these techniques that can help us to know the positive and negative of these techniques. This comparison can further be used to improvise and propose various new techniques for the same. Abstract - Security is one of the important aspects in mobile ad-hoc network (MANET). Also routing algorithm in MANET is dissimilar than traditional routing. This paper provides limits of traditional routing protocols if used to MANET. This paper also describes routing protocols at this time used in MANET and place focus on security analysis of routing protocol over quite a lot of possible security attacks such as Attacks by means of alteration, Denial of Service attacks, Wormhole attacks, Impersonation attacks, Attacks by means of fabrication, Rushing Attacks etc. lastly this paper emphasis on requirement for more robust protocol to identify wormhole attacks. Abstract - With the evolution of web technology, there is a huge amount of data present in the web for the internet users. These users not only use the available resources in the web, but also give their feedback, thus generating additional useful information. Opinion Mining is a process of automatic extraction of knowledge from the opinion of others about some particular topic or problem. Opinion Mining or Sentiment Analysis is a Natural Language Processing and Information. In this paper, design and develop a mobile rating and review summarization in mobile environment using latent semantic analysis (LSA) in support vector machines. Support vector machines and latent semantic analysis is implementing to develop rating and review summarization. Rating and review information is use sentiment analysis and feature based summarization. For classi?cation use support vector machine (SVM), it performs the sentiment classi?cation task also consider sentiment classification accuracy. Propose a Latent semantic analysis (LSA) to identify product features. Latent semantic analysis (LSA) is based on filtering mechanism; also ?nd a way to reduce the size of summary based on the product feature which is obtained from Latent semantic analysis (LSA).